Requires analog port selection during U30 system configuration and use of a S-FS-CVIA when using the H22-001 logger. 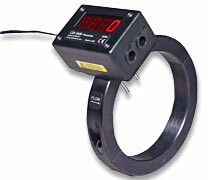 When using a U12 logger, this sensor requires a 4-20mA input cable (CABLE-4-20mA). Note: Recommended: 5200-DG (and 5400-S-DG) Drill Guide that facilitates accurately locating the holes that are needed to mount the flowmeter.